Upon arrival at Milano airport, transfer to your hotel. After checking in you are free to relax. Overnight in Milano. Breakfast and free day to explore Milano on your own: Pallazo Sforzesco, the Duomo – the world famous Cathedral, La Scala, etc. Overnight in Milano. After the breakfast, departure by train from Milano to Venice. Arrival in Venice and check-in at the hotel. The remainder of the day is free. Overnight in Venice. Morning guided walking tour (no entries) of this unique city. You will see the Piazza and Basilica of St. Mark, the Doge’s Palace, the Bridge of Sighs and the Prisons. Rest of the day at leisure. Overnight in Venice. After the breakfast, departure by train from Venice to Florence. Arrival in Florence and check-in at the hotel. The remainder of the day is free. Overnight in Florence. After the breakfast, departure by train from Florence to Rome. Arrival in Rome and check-in at the hotel. The remainder of the day is free. Overnight in Rome. 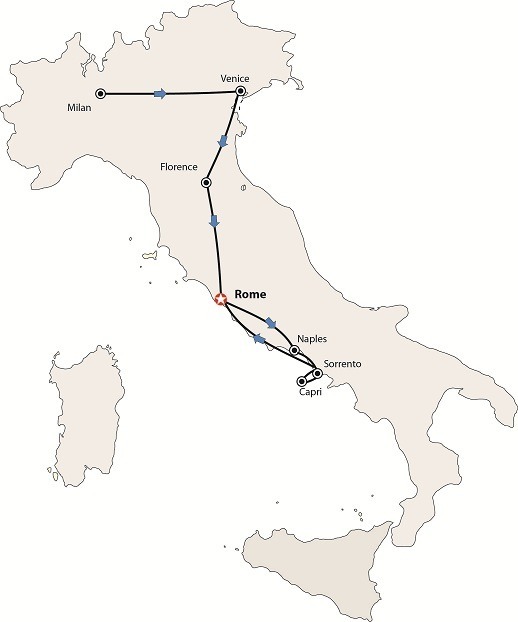 Day 9 Rome – Naples – Pompeii – Sorrento. Departure to Naples, panoramic city tour including Mergellina, Castel dell’Ovo, the Royal Palace. Continue to Pompeii. Visit the ruins. Lunch in a typical restaurant. After a short visit to a Cameo factory, proceed along the coast to Sorrento, a jewel of the Sorrentine Peninsula, famous for the cultivation of oranges, lemons and olive trees. Dinner and overnight. Continental breakfast. Day at leisure in Sorrento. Dinner and overnight at the hotel.